My husband has finished his first novel!!! Much happy dancing going on around here! 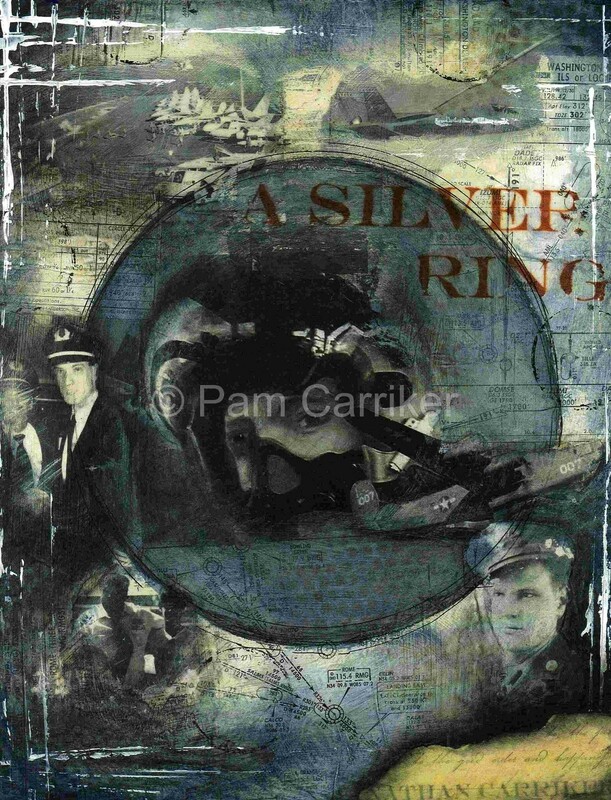 He is now in search of an agent and had asked me to do a piece of cover art for him, along the lines of ‘A Silver Ring’ which was published in Somerset in May. 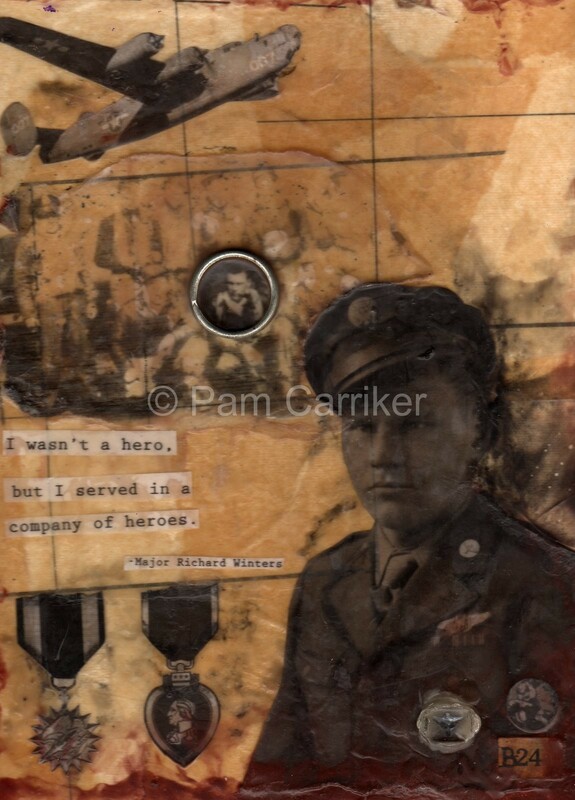 His novel is loosely based on his Uncle that is portrayed in this heroes inspired work. The book has the same title. He really liked what I came up with and I’m hopeful that it will help his submissions to stand out a bit. It can be long process at this stage, so we will sit with fingers crossed. 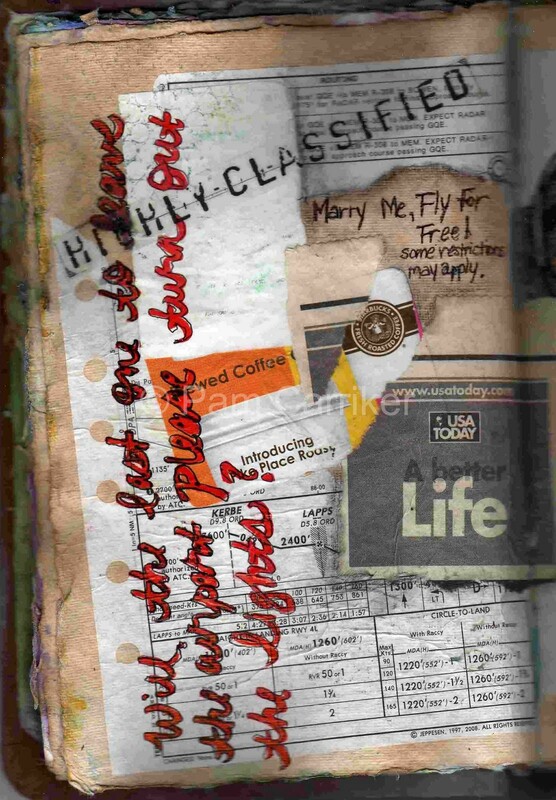 I also wanted to show you a couple of extreme journal pages that I did. These were done while waiting in an airport and I only used things found there, napkins, ticket stubs, newspaper, drawing things around me, and the background is stained with Starbucks coffee! I always carry, a gluestick, charcoal, black pigma pen, white gel pen, and water soluble crayon with a brush that holds water in the handle. All of these pass through security just fine. This is a great way to challenge yourself to be creative. So my friends, go and stretch your mind for a bit of creative exercise! Congrats to your husband! Wow what a creative family. And good luck in getting it published. I loved your tips on the supplies you take with you while traveling. 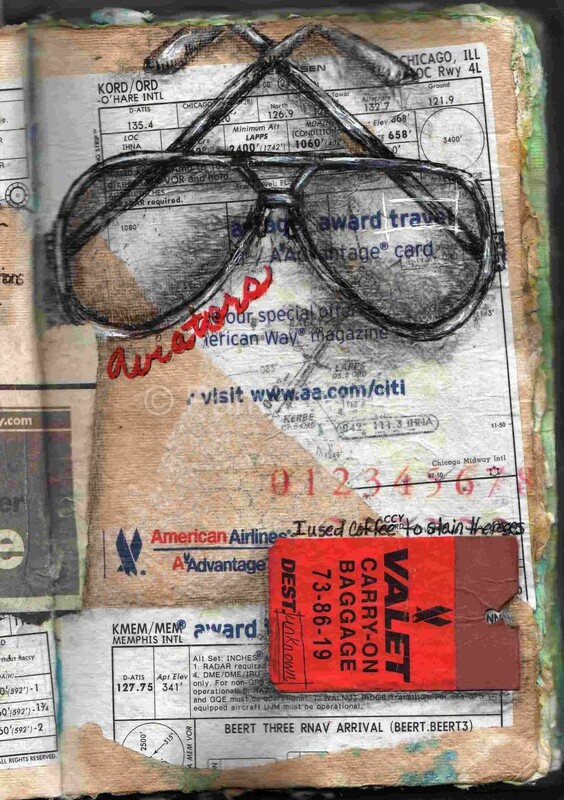 Great ideas…The journal you did while in the airport is so cool. Love it. Hi, Pam~Good luck with your husband’s book. Love the art you did for it.Thanks for the “traveling artist” tip.Great work, as always. Brilliant! Your artwork is sure to capture the attention of all who see it. Best of luck to you both.Your journal pages are fantastic and inspiring! I will be spending some time in airports this week and will definitely pack a mini artist survival kit. Thanks for sharing the supplies you had on hand.